Field judge Brad Freeman (88) and line judge Jeff Seeman (45) at an NFL game in October 2014. In American football, an official is a person who has responsibility in enforcing the rules and maintaining the order of the game. During professional and most college football games, seven officials operate on the field. Beginning in 2015, Division I college football conferences are using eight game officials, and the Alliance of American Football (AAF) began using eight game officials in 2019. College games outside the Division I level use six or seven officials. Arena football, high school football, and other levels of football have other officiating systems. High school football played under the National Federation of State High School Associations (NFHS) rules typically use five officials for varsity and 3, 4, or 5 for non-varsity games. Football officials are commonly, but incorrectly, referred to as referees, but each position has specific duties and a specific name: referee, umpire, head linesman (or down judge), line judge, back judge, side judge, center judge (used only in NCAA Division I college football and in the AAF) and field judge. Because the referee is responsible for the general supervision of the game, the position is sometimes referred to as head referee or crew chief. An official (right) watches Navy's Shun White (#26) score a touchdown against Tulsa. Visible on his belt are his yellow penalty flag and an orange bean bag. Used to signal a reminder to players that the ball is dead; i.e., that the play has ended or never began. A bright-yellow-colored flag that is thrown on the field toward or at the spot of a foul. For fouls where the spot is unimportant, such as fouls which occur at the snap or during a dead ball, the flag is typically thrown vertically. The flag is wrapped around a weight, such as sand or beans (or occasionally ball bearings, although this has been discouraged since an incident in an NFL game demonstrated that those could injure players), so that it can be thrown with some distance and accuracy and to ensure it remains in place and not moved by wind. Officials typically carry a second flag in case there are multiple fouls on a play. Officials who run out of flags when they see multiple fouls on a play may drop their hat or a bean bag instead. Used to mark various spots that are not fouls but which may be possible spots of penalty enforcement or illegal touching of a scrimmage kick. For example, a bean bag is used to mark the spot of a fumble or the spot where a player caught a punt. It is typically colored white, blue, black, or orange, depending on the official's league, college conference, level of play, or weather conditions. Unlike penalty flags, bean bags may be tossed to a spot parallel to the nearest yard line, not necessarily to the actual spot. A specially designed wristband that is used to remind officials of the current down. It has an elastic loop attached to it that is wrapped around the fingers. Usually, officials put the loop around their index finger when it is first down, the middle finger when it is second down, and so on. Instead of the custom-designed indicator, some officials use two thick rubber bands tied together as a down indicator: one rubber band is used as the wristband and the other is looped over the fingers. Some officials, especially umpires, may also use a second indicator to keep track of where the ball was placed between the hash marks before the play (i.e., the right hash marks, the left ones, or at the midpoint between the two). This is important when the ball is re-spotted after an incomplete pass or a foul. Officials write down important administrative information, such as the winner of the pregame coin toss, team timeouts, and fouls called. Game data cards can be disposable paper or reusable plastic. A pencil with a special bullet-shaped cap is often carried. The cap prevents the official from being stabbed by the pencil while it is in his pocket. Officials will carry a stopwatch (typically a digital wristwatch) when necessary for timing duties, including keeping game time, keeping the play clock, and timing timeouts and the interval between quarters. A pair of officials at a Maryland high school football game in September 2008. White knickers used to be worn by officials; black trousers are now standard. For ease of recognition, officials are usually clad in a black-and-white vertically striped shirt and black trousers with a thin white stripe down the side. Officials also wear a black belt, black shoes, and a peaked cap. A letter indicating the role of each official appears on the back of the shirt at some levels, while NFL officials have numbers with a small letter or letters above. Shortly after the September 11, 2001 attacks, an American flag was added to the shirts of NFL officials. The stripes were first introduced in the 1920s. Prior to this, plain white shirts were worn. College football referee Lloyd Olds is credited with the idea after a quarterback mistakenly handed the ball to him. The officials are colloquially called "zebras" due to their black-and-white striped shirts. During the 1940s the NFL officials wore color-striped shirts that represented their positions; black and white for referees, red and white for umpires, orange and white for head linemen, and green and white for field judges. During most of the American Football League's existence (1960–1967), officials wore red-orange striped jerseys. The referees wore red hats, the others white, each with the AFL logo; the league switched to the standard black and white stripes emulating the elder league for their last two seasons (1968 and 1969). The red and orange look was recreated in 2009 during AFL Legacy Weekends to mark the 50th anniversary of the AFL's founding. The United States Football League, which played from February to July in its three-season existence from 1983 to 1985, allowed officials to wear black shorts. The United Football League, which launched play in October 2009, featured officials wearing solid red polo shirts without stripes with black numbers and black pants. As no teams in the league wore red or orange, there was no prospect of a clash of colors. From 2010, the UFL switched to a customized version of the traditional black and white stripes, and wore this uniform until its 2012 shutdown. The Alliance of American Football's officials wear shirts that are black and white on top with stripes from the middle down, white stars on the sleeves and the number on the back and on the left front pocket, with black pants and the same hat system (white for the referee, black for all other officials) as all other levels of football. Stripes on officials' shirts in high school are one inch wide and in college are two inches wide, although in some states, high school officials wear shirts with two-inch stripes. NFL officials wear shirts with an uneven striping pattern. If wearing knickers, high school officials wear socks with a "Northwestern stripe" pattern, which college officials used to wear; NFL officials wore socks with two white stripes bordering one black stripe. In 2006, the NFL completely redesigned the shirts, going to a sleeker-looking uniform which, however, no longer identified a given official's position from the front. Also new for 2006 were black pants with a white stripe down the side to be worn in cold weather instead of the traditional white knickers. These looser-fitting pants allow for layering of warmer clothes underneath. In the 2010 season, college officials and, in many states, high school officials, were given the option of wearing the black cold-weather pants. The black pants became mandatory for college officials in 2011 and for NFL officials in 2012. In 2014, several high school associations started mandating the wearing of the black slacks for varsity level games. For several decades, all NFL officials wore white hats. 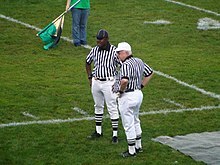 In 1979, the referees changed to black hats with white stripes, while the other officials continued to wear white ones. Finally, in 1988, the NFL switched to the high-school and college football convention: the referee wears a white hat (which now includes the NFL logo, first added for Super Bowl XXXIX), and the other officials wear black hats with white stripes. This has led to referees being referred to as "white hats". Officials' hats are also occasionally used as additional equipment. If a player not carrying the ball steps out of bounds (a wide receiver running a deep passing route or a player running downfield on punt coverage, for example), the official will drop his hat to mark the spot of where the player went out of bounds. The hat also is often used to signal a second foul called by the official on a play (by those officials that may carry only one flag); to indicate unsportsmanlike conduct committed against the official himself (as when a player shoves an official); or when some other situation requires a physical mark and the official has already used the ordinary item on the play. Some conferences discourage the use of the hat in these situations; the bean bag will be used instead. The following are the positions and responsibilities in the standard seven-official system, primarily used by the NFL, a number of conferences at various levels of college football, and various other leagues. Prior to the snap and during the play, each official, by position, has a specific area of responsibility on the field to watch specific player positions and watch for specific fouls. Using these prescribed mechanics ensures that the officiating crew sees all 22 players and their actions wherever they occur on the field. Additionally, during the dead-ball interval between plays, each official has separate administrative duties, such as counting players, timing the play clock, monitoring (or timing) the game clock, and spotting the ball as ready for the next down. A referee (foreground) follows the action of a play between the Texas Longhorns and the Rice Owls. Referee Ron Winter reviews a play in the replay booth during a game on November 2, 2008 between the San Francisco 49ers and Philadelphia Eagles. The referee (R) is responsible for the general supervision of the game and has the final authority on all rulings. In the NFL, he also has final authority on the score and the down number in case of any disagreement. Although all officials on the crew may be responsible for any decision involving the application or interpretation of the rules, the referee has the final decision. Thus, this position is sometimes referred to as head referee and is considered to be the crew chief. He can be identified by his white cap, while the other officials wear black caps (the hat color scheme was reversed in the NFL from 1979-87). During each play from scrimmage, the referee positions himself behind the offensive team, favoring the right side (if the quarterback is a right-handed passer). He also counts offensive players. On passing plays, he primarily focuses on the quarterback and defenders approaching him. The referee determines any fouls for roughing the passer and, if the quarterback loses the ball, determines whether the ball was fumbled or if an incomplete pass had been thrown. 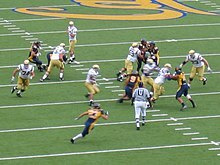 On running plays, the referee observes the quarterback during and after the time he hands off the ball to a running back, holding his attention on him until the action has cleared in case the play becomes a play action pass or some other trick passing play. After it has been established that the running back will keep the ball, the referee then checks the running back and the contact behind him. During punts and field goals, the referee observes the kicker (and holder) and any contact made by defenders approaching them. On a punt out of bounds, he uses his vantage point behind the punter to direct the nearest sideline official to the spot where the ball went out of bounds. In college football, the NFL and other professional leagues, and in some high school games, the referee announces penalties and the numbers of the players committing them (college and professional), and clarifies complex and/or unusual rulings over a wireless microphone to both fans and the media. During instant replay reviews in the NFL, the referee confers with the NFL's replay center in New York, which makes the final ruling. In college football, the referee confers with a replay official, who is stationed in the press box above the field, on the play and then announces the final result over the wireless microphone. In addition to the general equipment listed above, the referee also carries a coin to conduct the pregame (and if necessary, overtime) coin toss. An umpire watches a play from behind the defensive line during a game between the UCLA Bruins and the California Golden Bears. The umpire (U) stands behind the defensive line and linebackers (except as described below for the NFL), observing the blocks by the offensive line and defenders trying to ward off those blocks, looking for holding or illegal blocks. Prior to the snap, he counts all offensive players. During passing plays, he moves forward towards the line of scrimmage as the play develops to (1) penalize any offensive linemen who move illegally downfield before the pass is thrown or (2) penalize the quarterback for throwing the ball when beyond the original line of scrimmage. He also assists in ruling incomplete passes when the ball is thrown short. As the umpire is situated where much of the play's initial action occurs, he is considered to hold the most physically dangerous officiating position. For this reason, the NFL carried out experiments in the 2001 preseason with the umpire placed in the offensive backfield adjacent to the referee. In March 2010, the NFL announced that this repositioning would be permanent, after five major injuries were suffered by umpires in 2009 (two concussions and three knee or shoulder injuries requiring surgery). From 2010-15, the umpire returned to the defensive side of the line of scrimmage during the last five minutes of the second half. In 2016, this provision was deleted, and the umpire now stands in the offensive backfield on all plays at all times of the game. In addition to his on-field duties, the umpire is responsible for the legality of all of the players' equipment. The head linesman (H or HL), or down judge (DJ) in the NFL, stands at one end of the line of scrimmage (usually the side opposite the press box, always with the chain crew), looking for possible offsides, encroachment and other fouls before the snap. As the play develops, the head linesman is responsible for judging the action near that sideline, including whether a player is out of bounds. Responsibilities on a passing play include watching the receivers near that sideline to a point five to seven yards beyond the line of scrimmage. The head linesman marks the forward progress of the ball and is in charge of the chain crew with regard to its duties. In addition to the general equipment listed above, the head linesman also carries a chain clip that is used by the chain crew to properly place the chains and ensure an accurate spot when measuring for a first down. The NFL transitioned to the gender-neutral term down judge in 2017, when it moved Sarah Thomas to the position. This diagram shows the relative positions of the seven officials (in white) in relation to the typical offensive (in blue) and defensive (in red) formations. In the NFL, since 2015, the Umpire is positioned in the offensive backfield, opposite the Referee. The line judge (L or LJ) assists the head linesman or down judge at the other end of the line of scrimmage, looking for possible offsides, encroachment and other fouls before the snap. As the play develops, he is responsible for the action near his sideline, including whether a player is out of bounds. He is also responsible for counting offensive players. During the start of passing plays, he is responsible for watching the receivers near his sideline to a point five to seven yards beyond the line of scrimmage. Afterwards, he moves back towards the line of scrimmage, ruling if a pass is forward, a lateral, or if it is illegally thrown beyond the line of scrimmage. On punts and field goal attempts, the line judge also determines whether the kick is made from behind the line of scrimmage. In high school and minor leagues, the line judge is the official timekeeper of the game. In the NFL, college, and other levels of football, the official time is instead kept on the stadium scoreboard clock, and the line judge becomes the backup timekeeper. For the NFL, this was the sixth official, added in 1965. The field judge (F or FJ) works downfield behind the defensive secondary on the same sideline as the line judge. He makes decisions near the sideline on his side of the field, judging the action of nearby running backs, receivers and defenders. He rules on pass interference, illegal blocks downfield, and incomplete passes. He is also responsible for counting defensive players. He has sometimes been the official timekeeper, and in a number of leagues will run the game clock on a six-man crew. With the back judge, he rules whether field goal attempts are successful. For the NFL, this was the fourth official, added in 1929. The side judge (S or SJ) works downfield behind the defensive secondary on the same sideline as the head linesman or down judge. Like the field judge, he makes decisions near the sideline on his side of field, judging the action of nearby running backs, receivers and defenders. He rules on pass interference, illegal blocks downfield, and incomplete passes. He also counts defensive players. During field goal attempts he serves as a second umpire, except in the NFL, where he is the lone official positioned behind the defensive line, as the umpire remains in the offensive backfield. In college football, the side judge is responsible for either the game clock or the play clock, which are operated by an assistant under his direction. For the NFL, this was the seventh official, added in 1978. Back judge Lee Dyer picks up a penalty flag during a game on November 16, 2008 between the San Francisco 49ers and St. Louis Rams. The back judge (B or BJ) stands deep behind the defensive secondary in the middle of the field, judging the action of nearby running backs, receivers (primarily the tight ends) and nearby defenders. Like the Side Judge and the Field Judge, he rules on pass interference, illegal blocks downfield, and incomplete passes. He covers the area in the middle of the field between himself and the umpire. He has the final say regarding the legality of kicks not made from scrimmage (kickoffs). The back judge is also responsible for ruling a "delay of game" infraction if the play clock expires. With the field judge, he rules whether field goal attempts are successful. In college football the back judge is responsible for either the game clock or the play clock, which are operated by an assistant under his direction. For the NFL, this was the fifth official, added in 1947. During turnovers, punts, and other returns by the defense, and play transitions from one direction to the other, the officials must also adjust. The field judge, side judge, and back judge become the trail/back positions, and the referee, head linesman/down judge, and line judge then become the lead/front positions. The umpire, in his traditional position in the middle of the field, usually stays stationary until the returner and the other players pass him. Arena football, high school football, and other levels of football have other officiating systems. A three-official system uses only the referee, head linesman, and line judge, or in some cases, referee, umpire, and head linesman. It is common in junior high school and youth football. A four-official system uses the referee, the umpire, the head linesman, and the line judge. It is primarily used at lower levels of football, including junior varsity and some high school varsity. A five-official system is used in arena football (out of consideration for its smaller field size), most high school varsity football, and in most semi-pro games. It adds the back judge to the four-official system. In five-man high school crews, the linesman is responsible for the chain crew, the line judge is the official timekeeper of the game, and the back judge times the play clock and the one minute allowed for time-outs (only 30 seconds are allowed during team time-outs during televised college games to reduce time). A six-official system uses the seven-official system, without the back judge. It is used in some high school and college games except at Division I. In four games in the 2010 preseason, the NFL experimented with an eighth official, a deep judge, in the defensive backfield opposite the back judge. The primary responsibility for this new position is the action of receivers, and it allowed the NFL to adjust coverage after the umpire was moved to the offensive backfield. The experiment was continued for 12 games in the 2011 preseason. The league has yet to implement such a system for the regular season or the playoffs. In 2013, college football's Big 12 Conference began using an eighth official, an alternate judge (A). He stands in the offensive backfield opposite the head referee, in the same position as an NFL umpire, while keeping the Big 12 umpire in his traditional position behind the defensive line. The alternate judge will also help spot the ball. In the 2014 season, any conference that wanted to use the eight-official system could do so on an experimental basis. The Atlantic Coast Conference, Big 10 Conference, American Athletic Conference, and Big 12 Conference implemented an eight-official system for games; the eighth official's position name changed to center judge (C) but his location on the field was the same as the alternate judge was in 2013. The eight-man crews were used in bowl games, including games in the College Football Playoff, since officials from conferences using the eight-man crews were chosen for the three playoff games. In the 2015 season, the eight-official system became standard across all of FBS. It is also used by the Kansas Jayhawk Community College Conference. The Alliance of American Football uses the NCAA eight-man on-field crew, in addition to a ninth official called the sky judge, who has the authority to assess penalties (or overturn penalties) for unsafe play, and (within the final five minutes of the fourth quarter) either call or overturn pass interference penalties against either the offense or defense. The 2020 version of the XFL proposes using an eighth official known as the ball judge, which will be devoted solely to spotting the ball as quickly as possible to reduce downtime in the game. When the NFL began play, only three officials (referee, umpire, and head linesman) were used. The field judge was added in 1929 and the back judge in 1947. In response to scrambling quarterbacks (Fran Tarkenton in particular), the line judge was added in 1965 to watch the opposite side of the line of scrimmage. The side judge was added for 1978, when the NFL implemented new rules to open up the passing game. In 2017, the NFL renamed the head linesman to down judge. The practice of having the referee announce penalties or clarify complex and/or unusual rulings over a wireless microphone started in the NFL in 1975. College football and other professional leagues soon adopted this practice. For years, college football referees were prohibited from announcing the number of a fouling player, except in the Western Athletic Conference and Mountain West Conference (and in all conferences when ejecting the offending player). In 2004, the rules were changed throughout college football to permit the fouling player's number to be announced. Under NFHS rules used in all states except Massachusetts and Texas for high school games, announcing the player's number went from "not allowed" to "not required" in 2014. Among the various Halls of Fame for major North American sports, the Pro Football Hall of Fame is unique in that it has not inducted any officials; the Baseball Hall of Fame, Basketball Hall of Fame, and Hockey Hall of Fame have each inducted game officials as members. (The Hall has one officiating-related inductee; 1966 inductee Hugh L. Ray was inducted for his 14-season tenure as the league's head of officiating, an off-field position.) However, in Canada, the Canadian Football Hall of Fame has inducted a few game officials as members of their Hall of Fame. Because their regular season spans only 17 weeks, the NFL is one of only two major sports leagues in the United States that only pay their officials on a contract basis as opposed to being full-time salaried employees, the other being Major League Soccer. Advantages to this system include being able to eliminate unqualified officials simply by not offering them a contract the following season, where terminating full-time employees would require them to show cause. Critics argue that full-time officials would be free from the distractions of a second job, but proponents of part-time officials point out that the NFL would lose a number of qualified officials because many of them are owners, presidents, or CEOs of various companies. Proponents also argue that there is only one game per week and the regular season is only four months long, and that having full-time officials does not necessarily guarantee that they will make fewer officiating mistakes. The level of training and review in which NFL officials participate makes additional time redundant. In any event, veteran officials can earn substantial salaries for their work. The NFL Referees Association serves as the union that represents officials in the NFL. Replacement officials were used through Week 3 of the 2012 NFL season following a contract dispute between the NFL Referees Association and the NFL. Most of these replacements were high school officials or officials for lower-level college divisions. None of the replacements were Division I college officials, since the league wished to protect them from union backlash and allow them to continue working their scheduled games during the concurrent college football season. In addition, current and former NFL officials serve as Division I conference officiating supervisors, and did not allow their officials to cross the picket line. The replacement officials' performance was highly scrutinized and ridiculed by fans, players, coaches, and the media. The final play of the Green Bay Packers–Seattle Seahawks game on Monday Night Football in Week 3 saw Seattle quarterback Russell Wilson throwing a Hail Mary touchdown pass to wide receiver Golden Tate that officials ruled was simultaneously caught by Packers safety M. D. Jennings. Prior to the catch, Tate shoved a defender with both hands, which the NFL later acknowledged should have drawn an offensive pass interference penalty that would have negated the touchdown and resulted in a Packers victory. The contentious nature of the replacement officials' decision at the end of the Packers–Seahawks game is widely considered to have been the tipping point that finally led to an agreement being reached to end the lockout prior to the Week 4 games. Historically, American football officials have been men. In 2007, Sarah Thomas became the first woman to officiate a major college football game, working a game between Memphis and Jacksonville State. Thomas later became the first woman to officiate a bowl game when she worked as a line judge during the 2009 Little Caesars Pizza Bowl between Marshall and Ohio. Since then, other women have officiated Division I college football games. Terri Valenti became the first woman to officiate professional football when she began working United Football League games in 2009. The UFL later hired Thomas in 2010. In 2012, Shannon Eastin became the first female official of an NFL game. She was a replacement line judge while the league had locked out the regular officials due to a labor dispute. Darin Gantt of Profootballtalk.com and Sam Farmer of the Los Angeles Times lamented that it was in this manner that this gender barrier was broken . In 2015, Thomas became the NFL's first permanent female official. She entered as a line judge, and moved to the down judge role in her third season. ^ Markbreit, Jerry (November 23, 2005). "Jerry Markbreit's answers: The former NFL referee answers readers' questions each week throughout the season". Chicago Tribune. Archived from the original on October 19, 2006. ^ Pascoe, Bruce (August 14, 2006). "Grad of CDO finds fame as NFL referee". Arizona Daily Star. Tucson. Archived from the original on January 8, 2007. ^ Zimmerman, Lisa (July 10, 2001). "Replay booth: Positively no visitors". NFL.com. Archived from the original on 2007-07-17. Retrieved 2007-03-10. ^ a b Roberts, Rich (October 24, 1985). "AN NFL UMPIRE'S . . . LIFE IN THE WAR ZONE - For His Own Protection, This Official Must Read Defenses and Offenses; Draw Plays Are Murder". Los Angeles Times. Archived from the original on October 2, 2011. Retrieved 2009-09-02. ^ "Fashion statement: NFL refs to sport new uniforms". ESPN. Archived from the original on 2007-07-12. ^ "NFL experimenting with putting umpire in offensive backfield". CBC. August 4, 2001. Archived from the original on September 9, 2010. Retrieved 2009-10-23. ^ Mortensen, Chris (March 22, 2010). "NFL moves umpires for safety's sake". ESPN. Archived from the original on March 26, 2010. Retrieved 2010-03-23. ^ a b Austro, Ben (June 16, 2017). ""NFL has a new name for the head linesman position: down judge"". Football Zebras. Archived from the original on June 19, 2017. Retrieved June 16, 2017. ^ a b "Football so fast, complex: NFL adding sixth official". Spokesman-Review. Spokane, Washington. Associated Press. July 25, 1965. p. 3, sports. ^ a b c d Strickler, George (February 20, 1965). "Sixth N.F.L. official to watch scramblers, clock". Chicago Tribune. p. 1, sec. 2. Archived from the original on October 8, 2015. ^ GHSA Football Officials Manual 2009 (PDF). Georgia High School Association. p. 60. Archived from the original (PDF) on 2010-03-31. ^ "2009 FOOTBALL MANUAL For IOA Officials, Observers, Athletic Directors, and Coaches" (PDF). Intercollegiate Officiating Association. p. 12. Archived from the original (PDF) on 7 June 2011. Retrieved 26 February 2010. ^ a b "NFL revises rules to promote points". Milwaukee Journal. UPI and AP. March 15, 1978. p. 18, part 2. ^ "National League officials to work in crews of six (five)". Milwaukee Journal. Associated Press. August 19, 1947. p. 6, part 2. ^ "NFL experimenting with 8th on-field official". August 25, 2011. Retrieved August 25, 2011. ^ Dodd, Dennis (July 22, 2013). "Big 12 adds eighth official just to keep up with up-tempo offenses". CBS Sports. Archived from the original on December 4, 2013. Retrieved December 7, 2013. ^ Murphy, Brian (August 4, 2012). "Minnesota Vikings, NFL turning to replacement officials, for better or worse". Pioneer Press. Archived from the original on August 4, 2012. Retrieved August 4, 2012. ^ "Refs due back Thursday night". ESPN.com. September 27, 2012. Archived from the original on September 29, 2012. Retrieved September 27, 2012. ^ a b Borden, Same (August 27, 2012). "With Referees Out, N.F.L. Stars Throw Flag on Novice Fill-Ins". The New York Times. Archived from the original on August 29, 2012. Retrieved August 27, 2012. ^ "NFL upholds Seahawks' disputed win over Packers". SI.com. Associated Press. 2012-09-25. Archived from the original on 2012-09-28. Retrieved 2012-09-26. ^ "NFL referees agree deal with league to end lockout". Reuters. Archived from the original on 2012-09-30. Retrieved 2012-09-27. ^ Battista, Judy (September 27, 2012). "N.F.L. Reaches Labor Deal With Referees". The New York Times. Archived from the original on December 20, 2013. Retrieved September 27, 2012. ^ Zinser, Lynn (September 27, 2012). "Leading Off: N.F.L. Undervalued Competence, Paid in Integrity". The Fifth Down. The New York Times. Archived from the original on September 28, 2012. Retrieved September 27, 2012. ^ "Thomas will become first female referee in top tier of college football". ESPN. Associated Press. September 14, 2007. Archived from the original on August 14, 2012. Retrieved August 6, 2012. ^ "Thomas on field for Little Caesars Bowl". Yahoo! Sports. Associated Press. December 27, 2009. Archived from the original on November 8, 2012. Retrieved August 6, 2012. ^ Reiter, Bill (September 6, 2011). "Female ref Conti still chases NFL dream". Fox Sports. Archived from the original on August 7, 2012. Retrieved August 6, 2012. ^ "UFL hires first female official in pro football". Newsday. October 6, 2009. Archived from the original on December 3, 2013. Retrieved August 6, 2012. ^ "United Football League Announces Officials And Explains Rules Differences For 2010 Season". OurSportsCentral.com. 2010-07-29. Archived from the original on 2011-06-29. Retrieved 2010-07-29. ^ "NFL's replacement officials would include first female ref". ProFootballTalk. July 22, 2012. Archived from the original on July 28, 2012. Retrieved August 6, 2012. ^ "Football referee Shannon Eastin a pioneer, but also a pawn". Los Angeles Times. August 8, 2012. Archived from the original on August 8, 2012. Retrieved August 8, 2012. ^ "NFL makes Sarah Thomas first full-time female official". nfl.com. Archived from the original on 20 December 2017. Retrieved 5 May 2018. ^ "Sarah Thomas, NFL's 1st Full-Time Female Ref, Gets 2015 Season Assignment". yahoo.com. Archived from the original on 7 May 2016. Retrieved 5 May 2018. Wikimedia Commons has media related to American football officials. football.refs.org - officiating rules and mechanics for college and high school football.